At this stage, you may not be able to start the Exchange Message Transfer Agent (MTA) service on your Exchange Server computer. An Event ID 474 error indicates that a problem in the hard-disk subsystem has caused damage to your Exchange database. Initially, move all user mailboxes to a second Exchange Server and dismount the mailbox store. To ensure transactional consistency in your database, you should copy all transactional log files to a safe location. This would enable you replay mail messages even if the backup program overwrites these files during the restore operation. Identify the root cause of the problem by checking your firmware compatibility or detecting the defective device in your hard-disk subsystem. You should also verify the file system for corruption. Try to determine and diagnose the problem quickly. Use backup software to restore your database from a backup. Ensure that the backup program does not mount the database after the restore operation. The previous operation may result in overwriting of the transaction log files. In this case, you can copy the transaction log files from the location where you previously saved them to the ‘Mdbdata’ folder. Try to remount your mailbox store. 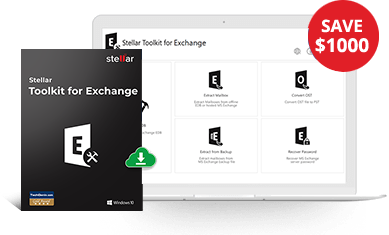 If you do not have the database backup or the above procedure fails to mount the Exchange mailbox store, use Stellar Exchange Mailbox Recovery Tool to recover all your lost invaluable Exchange data. The software repairs damaged Exchange databases (.EDB) files for extracting various user mailboxes and restoring them as individual Outlook PST files. It recovers all types of mail items, such as messages, contacts, notes, tasks, calendar entries, and journal records.